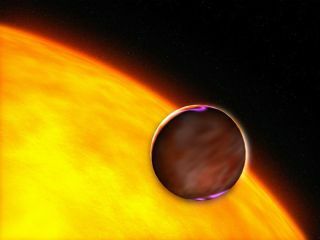 This conceptual image shows the XO-1b planet, which is very similar to the newly discovered planet XO-3b. HONOLULU?A teamof amateur and professional astronomers has discovered a mammoth orb more than13 times the mass of Jupiter that whips around its parent star in fewer than fourdays and is considered an ?oddball? planet among its exoplanet relatives. The newexoplanet, dubbed XO-3b, was described here at a meeting of the AmericanAstronomical Society. The discovery came out of the XO Project, a collaborationbetween amateur and professional astronomers. "Ofthe 200-plus exoplanets found so far, XO-3b is an oddity in severalrespects," said XO Project director Peter McCullough, an astronomer at theSpace Telescope Science Institute in Baltimore. For one,it?s the largest and most massive planet found in such a tight orbit around itsparent star. Secondly, with such a close proximity between the planet and star, astronomers would expect acircular orbit as the parent star?s gravity tugs and shapes the orbit. ButXO-3b treks along an elliptical orbit. And duringevery orbit, XO-3b passes in front of its star, making it a ?transitingplanet,? of which just a few dozen have been identified. The findingalso stirs up an already frothy debate concerning the boundary between browndwarfs and massive planets. "Weare intrigued that its mass is on the boundary between planets and 'browndwarfs,'" said Christopher Johns-Krull, an astronomer at Rice University. "There's still a lively debate among astronomers about how to classifybrown dwarfs." Browndwarfs are too massive to be considered planets,yet they don?t meet the "Sumo-weight" requirements for hydrogenfusion (about 80 Jupiters) so they fall short of being stars. The new object?smass is right on the boundary where brown-dwarf status begins, a massrequirement for the burning of deuterium, or heavy hydrogen. "Thecontroversy lies at the lower end of the scale," Johns-Krull said. "Some people believe anything capable of fusing deuterium, which in theoryhappens around 13 Jupiter masses, is a brown dwarf. Others say it's not themass that matters, but whether the body forms on its own or as part of aplanetary system." Even ifscientists determine XO-3b to be a brown dwarf, the object would still have?celebrity? status. Due to their mass, brown dwarfs should be easy forastronomers to spot. That?s because when hunting for exoplanets,astronomers usually look for them indirectly via the wobblesin stars caused by the gravitational tug of the orbiting planet or planets.The heftier the orbiting planet, the more it should shake its parent star.However, sky scanners haven?t spotted a treasure trove of brown dwarfs and thisscarcity has become known as the ?brown dwarf desert.? "Thereare many astrophysical systems out there that mimic transiting planets,"McCullough said. "The only way to sort out the real planets from the restis to observe the stars more carefully,? and come up with accurate mass andother measurements.